What Facts Should I Know about Ear Pain from Scuba Diving? What Causes Ear Pain from Diving? What Are the Symptoms of Ear Pain for Diving? When to Seek Medical Care for Ear Pain by Diving? What Exams and Tests Diagnose Scuba Diving Ear Pain? Are there Home Remedies for Scuba Diving Ear Pain? What Is the Treatment for Scuba Diving Ear Pain? What Is the Follow-up from Scuba Diving Ear Pain? How Do You Prevent Ear Pain from Scuba Diving? Ear pain is the most common complaint from scuba divers and is experienced by almost every diver at some point. Some divers call it ear squeeze. The pain occurs because of differences in pressure between the middle ear and the outside environment. Ear pain occurs during the descent portion of a dive as the diver drops deeper underwater. As the diver descends in the water, water pressure increases on the external surface of the ear drum (tympanic membrane). To counterbalance this pressure, the air pressure must reach the inner surface of the ear drum. 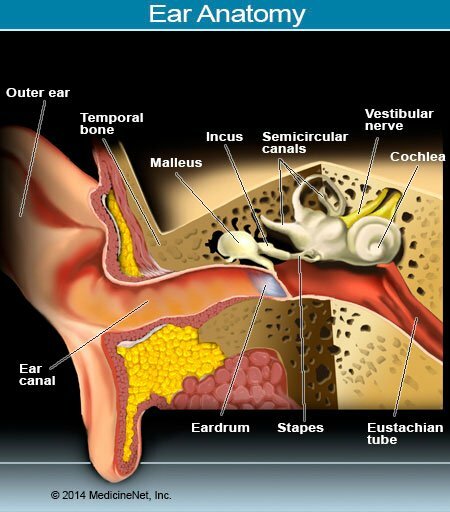 To do this, the Eustachian tube will open and allow the pressure behind the eardrum to equalize with the outside pressure of the seawater in the ear canal. If the Eustachian tube can't open, however, then as the seawater pressure in the ear canal increases, the eardrum is forced inward, inflaming the eardrum and causing pain. If the pain is ignored and the diver drops deeper, the pressure will continue to increase and the eardrum may burst (rupture). Cold seawater will then rush into the middle ear causing nausea, vomiting, and dizziness. If high pressure ruptures the eardrum, air bubbles may be felt coming from the ear and the pain may lessen. However, as the cold water then enters the middle ear through the hole in the eardrum, the diver may become nauseated or vomit. The diver may also become disoriented or have a sensation of imbalance, Dizziness, or spinning (vertigo). Upon returning to the surface, the diver may feel fluid draining out of the ear if the eardrum has been ruptured. Rarely, a one-sided facial paralysis may be associated with ear squeeze. The majority of cases of ear pain or squeeze force the diver to abort the dive before the eardrum ruptures. In these cases, symptoms often resolve shortly after the diver reaches the surface. If symptoms continue or the cause of the ear pain is not known, seek medical care. Disorientation, vomiting, and hearing loss are symptoms of a ruptured eardrum and require medical care. If a ruptured eardrum is present or suspected, the diver should be evaluated in a hospital's Emergency Department. Transport by car is acceptable. No further dives should be undertaken until the diver is medically cleared. The physician will evaluate the possibility of ear squeeze with a series of questions regarding the dive. These questions not only help diagnose the ear squeeze but also detect other potential dive injuries. Did the diver experience difficulty clearing the ear? Did the symptoms begin during descent or ascent? Were the symptoms present during the dive or after reaching the surface? Is there a history of ear or sinus infections? Hearing loss or facial paralysis may also be present. X-rays and blood tests are not needed. The treatment of ear squeeze begins during the dive. If a diver feels fullness or pain, stop the dive and attempt to clear the ears. If ear clearing techniques fail, the dive must be ended. Always complete the decompression stops if necessary when returning to the surface. If the eardrum ruptures, the diver may become disoriented or vomit, which may lead to panic. Panic may lead to ascending too rapidly. The diver's partner (dive buddy) should carefully observe and assist during the ascent. On the surface, keep the ear dry. Do not place anything in the ear. The most important treatment was done by aborting the dive and ascending to the surface, making any necessary decompression stops. Initial treatment involves the use of oral decongestants and nasal spray to help open the Eustachian tube. Antihistamines may also be prescribed if an allergy is a contributing factor. Pain medications can be helpful. Eardrops to relieve pain may be used if the eardrum is not ruptured. A ruptured eardrum will require antibiotics by mouth to prevent infections. If the patient has a facial paralysis, oral steroids may be prescribed. Avoid eardrops. Put nothing into the ear. The patient may be referred to an ear, nose, and throat specialist to monitor the eardrum healing. No further diving should be undertaken until all symptoms are resolved and the eardrum is healed; then wait two more weeks before attempting to dive again. Hearing exams or audiograms may be needed if the eardrum is ruptured or hearing loss is present. Prevention is the preferred treatment for ear squeeze. Divers who are unable to clear their ears or experience ear pain should stop their descent and abort the dive. Divers clear their ears by several methods. The most common is plugging the nose, closing the mouth, and blowing. This increases the pressure in the mouth and throat and pushes the Eustachian tubes open. Divers should equalize their ears early and often when descending. Diving should not be attempted if any sinus or upper respiratory symptoms are present. Most ear pain with scuba diving will go away by itself usually within a week without long-term effects. Eardrum ruptures usually heal themselves over longer periods of time but sometimes require surgical repair. Facial paralysis, if present, most often is temporary. Mild hearing loss may continue.